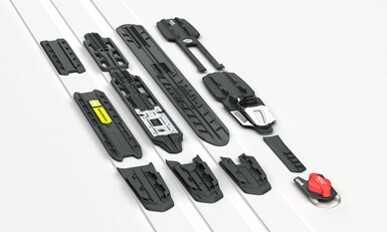 The Rottefella company has created the binding solution for waxless and skin cross country skis. The Move Switch is a dial on the front of the binding that will allow skiers to slide the binding forward or backwards without releasing the ski from the boots. That’s right, while you are on the ski trail, you can just bend over and turn the switch for the binding to slide and adjust to the desired weight distribution on each of the skis. The intention of the Move Switch is for quick adjustment and better performance on flat or hilly terrain for recreational skiers who use waxless skis and particularly the quiet skin skis that have a mohair-type strip embedded in the ski base. If you want to glide better on a slow snow day on the flat trail, then stop and slide the bindings backwards to distribute your weight on the ski to provide more glide. If you need more grip to go up a hill, then slide the bindings forward to attain an enhanced grip to prevent slipping backwards on the snow. Rottefella has created a moveable binding system that will be available for and can adapt to work with major existing ski plate systems at the other binding manufacturers including Rottefella NIS, Fischer, Rossignol, Salomon, and Atomic. 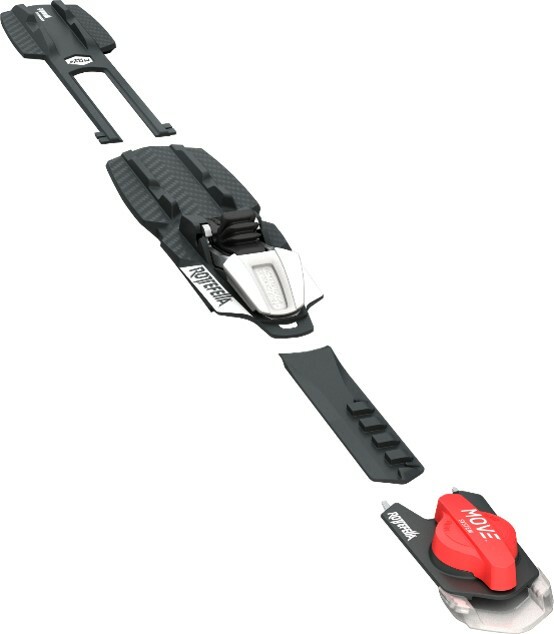 There is also a binding, Rottefella Classic or Skate Quicklock plate that is moveable when skis are removed for those not expecting to move the bindings while skiing. The Move Switch will make it easier to adjust the ski bindings as necessary correlating to the snow conditions or terrain. In the olden days, such changing required applying different waxes but with the new products, those days should be in the past for recreational cross country skiers. Using waxless skis eliminated the need for waxing the bases, but they worked differently in varying conditions or terrain – some grip well but are slow on the flats, while others glided well but did not hold when going up a hill. The retail price for a system or plate package will run between $69.99 and $149. Currently, the skin waxless skis may comprise about 25% of the new XC ski market as skiers are opting for the quiet base that provides good grip and glide in various ski conditions.